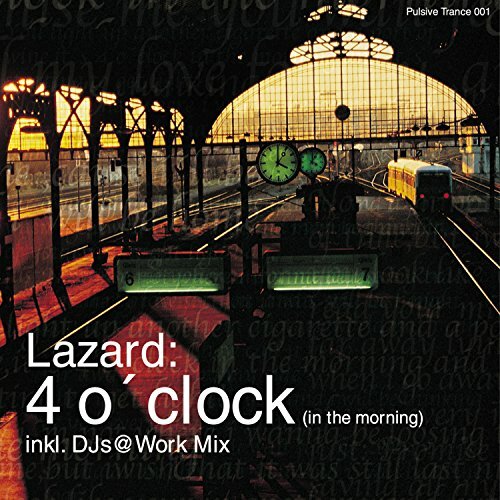 (A4)~"BROKEN MIX" 4 O'CLOCK~Seeds!! !~~~~~Full & Fragrant! 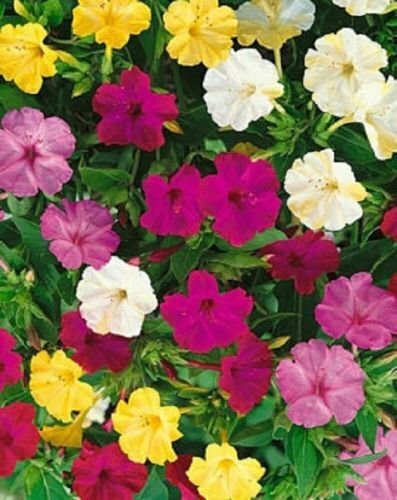 Life Cycle- Annual/Perennial Bloom Color- Mix Zones- 3-9 Sow- 1/4" Sun- Full Soil- Moist, Well Worked Germination Time- 10-21 Days Height- 24-36" Space- 12-24"
An old fashioned favorite, four o-clocks are fast growing bushy plants which are easy to grow from wild flower seed. They grow to about 36 inches tall and are covered with trumpet shaped, fragrant flowers that are attractive to hummingbirds. 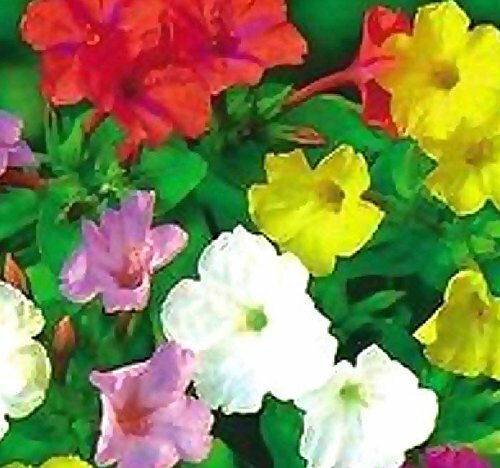 Flowers may be shades of red, pink, yellow, white or striped. 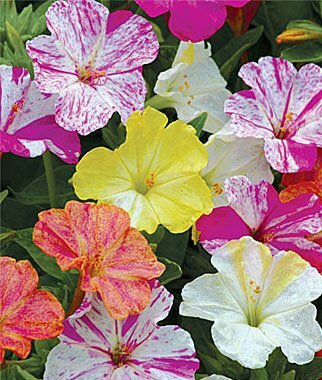 Mirabilis flowers do not open until the late afternoon, and they are a wonderful addition to an evening garden. The plant will grow as an annual in all zones, and will be a perennial in frost free zones. 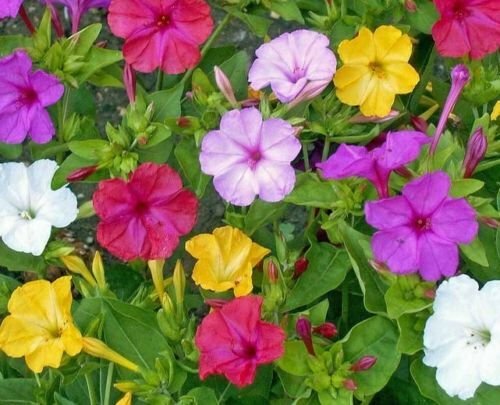 Four o' clocks thrive in ordinary soil in full sun or partial shade, sending up numerous volunteer seedlings every year (even in cold parts of the country.) These wild flower seeds may be sewn directly into the garden in the spring in warm areas. In other areas, start the seeds indoors about eight weeks before the final frost date in spring for transplanting. These seeds are poisonous. 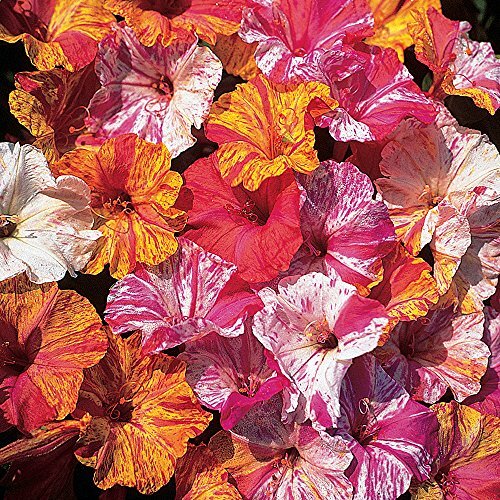 Our breeders developed a mixture of multicolored four O'clock cultivars in a wide range of bicolors that includes pink, yellow, red & white. With 'Kaleidoscope', you won't have to peer through a tiny hole to enjoy its vivid beauty! 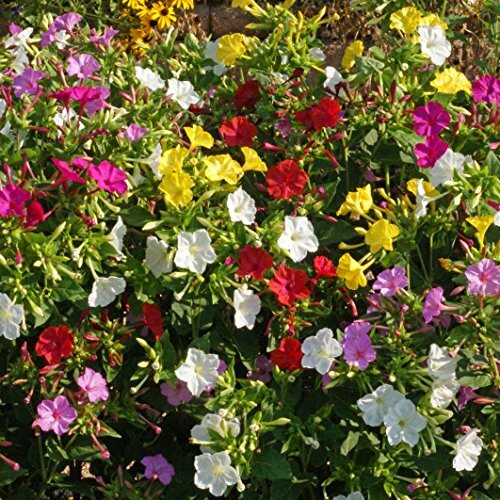 plant in average, well-drained soil after last frost, & this annual will reward you with a summer full of colors. Shopping Results for "Four Oclock Mix"